Some would consider 1911’s to be the most American handgun. Of course, it doesn’t get any better than the Kimber 1911. 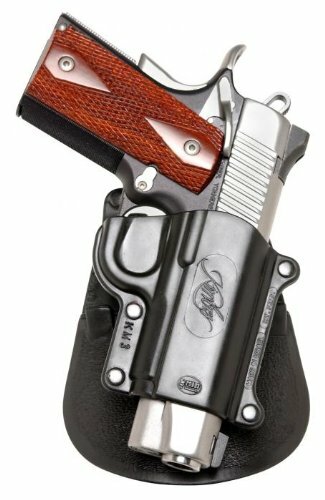 You being here means you’re looking for the best Kimber 1911 holster, of course. Many industries have chosen and switched to using Kimber’s firearms, and as I’m sure you know it’s because they are dependable, top-quality, and accurate. What kind of holsters exist to match their quality, then? While we’ll go over a few options, I’d like to start off with my favorite option for the Kimber 1911. The Fobus Standard Holster RH Paddle is a high quality, reliable holster. Because it is left open at the bottom, it is able to fit a variety of 1911’s, and is an excellent fit for your Kimber. 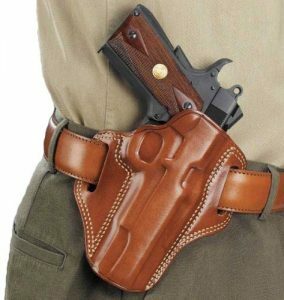 Keep in mind though, this holster only has right handed as an option. While I will give a list of some other holster that I think are great, let’s take a minute to discuss something. Perhaps you’ve heard a lot about 1911’s, and by that I mean the controversy of whether they’re the best models or not. While I can’t decide that for you, I can give some of the facts about them and what makes them so popular, despite the debate. John Browning was the inventor of the original 1911, and it was adopted by the U.S. Army on March 29th, 1911. Thus, the official name was given to it as the Model 1911 (also referred to as the M1911). Over the last 100 years, many variations and models have been made to better the original copy, making the ancestry of the M1911 very long and historical. The term 1911 has come to reflect many types of this pistol, classifying nearly all 1911-type handguns under the name. Does That Mean it’s Outdated? Yes, one of the debates is whether it’s outdated or not. When you take a look at it, it really cannot be classified as outdated. There are multiple manufacturers and designers who have credited John Browning’s original invention as the basis for their creation. While the models vary from maker to maker, and time does develop new technology, there is an underlying skeleton that points back to Browning’s original that keeps it a classic even to this day, now over 100 years later. While you might be wondering who uses these, you won’t have to look very far. There are military units who still use it, such as the MARSOC Marines, and many branches of law enforcement as well. You’ll also find it widely used in competitive and athletic shooting, being a dominant firearm that has won championships and remains a leading sidearm. Of course, whether you are or are not any of these, there are also a vast amount of people who use it for self and home defense. If you have the proper training, utilize the fundamentals of gun safety and marksmanship, the 1911 is not a bad choice for beginners at all. One concerns novice might have would be the weight of the gun. Some 1911’s are known for being heftier, but there are lightweight options among the different manufacturers. It is also a common choice for smaller people due to the narrow grip and slide, and can be handled with ease given the quality of the training put into it. Like I mentioned before, there’s debate on whether it’s the best or not. The 1911 has its own faithful users who claim it to be the best, but what makes it the best in their eyes? Accuracy. While some guns are more complex and accuracy is not their quality with the novice shooter, the 1911 does have more capability to be more accurate than most. I can’t claim it to be the best, since that is debatable as so clearly seen throughout the firearm world, but I can say it’s definitely one I’d consider. The Trigger. One of the things that makes it so wonderful to shoot is its light trigger. It is described as crisp and sweet by many avid 1911 fans, and requires very little pressure to engage. This can be seen as dangerous, but in competitive shooting it is a prime aspect. Customization. The aftermarket of the M1911 is unmatched as of yet. No other gun models out there have as many aftermarket parts as the 1911’s do so if that’s a priority for you, you can see why many people rave about them. Variety. Yes, I’ve said it throughout this that there are many makes and models. Over a century worth! This can be seen as a benefit since you are almost guaranteed to find something that fits your liking. Now you have the other side. The ones who prefer their glocks or other sidearm, and don’t see the use of the 1911. Why, though? Given all those good things above, why is it they deem there is better? Cost. Right of the bat, money can be a huge issue for a lot of people. This being especially true when the lowest and simplest models of 1911. Safeties. The 1911 has multiple safety devices, which to some can be seen as a plus. However, it has been argued that these safeties are excessive and may put someone in harm in a dangerous self-defense situation. Overlooking them will leave the firearm useless in a time of need, and can result in a severe cost. Ammunition Capacity. The majority of M1911’s are single stack, which for such a size and style of pistol is very underdone to many. While you can get a double stack 1911’s that match their competitors, they are much more difficult to come by. Weight. This gun packs on almost an extra pound compared to any other single stacked polymer-framed pistol, and is still heavier than a fully-loaded Glock 19. While it doesn’t sound like too much weight, in the long run it will weigh on you. This does seem pointless to some because of the fact that you’re carrying half the ammunition as the Glock, all for just about the same weight, if not more. Ultimately, the choice is yours what you prefer. The world can go on debating, but it is your personal preference that determines what side of the fence you fall on, and no one should guilt trip you about it. Onto the other holster, let’s take a look at a few options that might fit your fancy for the Kimber 1911. This holster does a great job of bearing the weight of the Kimber 1911, is reliable, and is quality made. Keeping in mind it’s only made for the right handed carrier, it’s a great choice when it comes to this model. 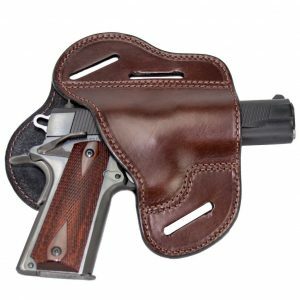 Another leather option handmade in America with quality cowhide leather, this holster makes the top picks list. 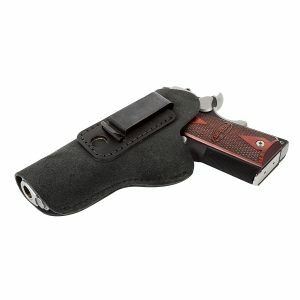 Made to fit close to body and keep good retention, you’ll find this holster to be a reliable choice. If you’re looking for a holster built specifically for IWB, this genuine suede leather one is a good option. It’s made in America, quality material, and very comfortable. The Fobus Standard Holster RH Paddle KM3 still remains my personal favorite of the choices. It handles the weight of your Kimber 1911, conceals well, and is highly dependable. Of course, perhaps you like another of the options a little more. Let us know your favorite, or if you find another holster that works well. We always enjoy hearing from our readers. All great looking holsters but I’m concerned with the black finish wearing off the slide of my Kimber Ultra Crimson Carry 2.